Many times we’ve posted tips on Facebook, Twitter, and Google+ explaining that keeping shoes at the door is one of the best ways to keep carpet and rugs clean. Recently I was watching an episode of The Chew, and Clinton Kelly was giving tips on hosting a great party. One of his tips was to never ask guests to remove their shoes. He went on to say something like – if you love your carpet more than your guests, then you probably shouldn’t be having a party. After much animated discussion, Greg and I agreed that it is perhaps a bad idea to ask your boss or guests of a formal dinner party to remove shoes, but family and close friends are fair game, especially if the event is informal. Removing shoes is a given in our house. In fact, I have most guests trained to do so – folks that know me well, know how neurotic I am. I love the fact that they are willing to feed my neurosis. So we’ll use removing shoes as suggestion one, but obviously do what you are comfortable with. So below are three, more reasonable suggestions. • Use inexpensive rugs. Consider strategically placing them where there might be a lot of foot traffic, and temporarily replace an expensive Persian rug with an inexpensive rug during the holiday season. • Finally, address dirt and spills quickly. Be sure to vacuum regularly and remember to blot stains, never rub or scrub your carpet. 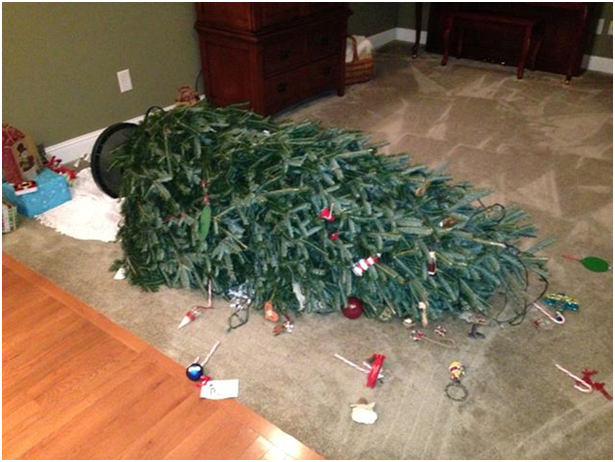 Hopefully these tips will help you keep your carpet and rugs from becoming too scathed over this holiday season! I find the older I get, the more I enjoy giving more than receiving. Last week, Gray and I purchased items to fill an Operation Christmas Child shoebox for Samaritan’s Purse. I found myself smiling as we wrapped the box with Christmas paper. I thought about how the child might react when he opened the box and how this small box might impact his life. I’m sure you experienced similar feelings as you dug through your closet looking for an outgrown or no longer worn coat. Then I bet you also smiled as you dropped off that coat at your nearest A Cleaner World location. So thank you for donating. This year saw probably the greatest need since the campaign started. We shared these pictures of long lines at both the Greensboro and High Point Salvation Army Give A Kid A Coat distributions locations on Facebook, Twitter, and Google+. The 2013 Give A Kid A Coat campaign collected 18,412 coats this year. Your coat will keep someone special, maybe that someone is in one of the above pictures, warm this winter, and you never know how that one small act of giving might impact that person. About a year ago, I had a bad alteration experience. Since I live in Tennessee, I no longer have access to the alteration professionals at A Cleaner World. So I asked a lady in my women’s Bible study group – who sewed and quite well as I’d seen a number of things she’d made – if she did alterations. I explained that I had several pairs of khaki pants that were too big in the waist. She said that was no problem; she did those types of things all the time. Whenever I see an info-mercial for a crazy gadget on TV, I think who would buy that stuff? Apparently my parents would. And if I’m going to be completely honest, this was a good purchase. During a visit home, my mom asked my dad and me to rearrange the furniture in their bedroom. We got to work, and it didn’t take my dad long to figure out that I wasn’t going to be able to lift their massive king size bed – even after we removed the mattress and box spring. He left the room and returned with some coaster looking things. We placed one under each of the corners, and then we easily scooted the bed into position. When I asked where he got them, he said he saw them on an info-mercial! I poked fun at him a bit but the truth is these things were really handy. I tell you this – not to endorse a product – but because I wanted to give a word of caution about moving furniture. We used these little gems because I simply wasn’t strong enough. But if you have furniture that is exceptionally heavy or that has sharp edges on the bottom, use caution when moving. It is possible that sliding it across your carpet without any protection could result in some damage to your carpet. Consider using a product similar to what we used or place a heavy duty blanket under the piece before moving. Either one will make it easier, but it will also provide a barrier of protection between the furniture and your carpet. If you know anything about alterations then you know that most garments can be taken in up to 3 sizes. But when it comes to letting a garment out, it ranges from 0 to 2 sizes depending on how much leftover fabric there is on the other side of the seam. Unless you are Lan Nguyen, former alteration specialist at the A Cleaner World located off Union Cross Road in Kernersville. I say former only because after 30 years of service with A Cleaner World, she recently retired. Good for her! A couple months ago, a customer came by with a wedding gown she had purchased at a second-hand store. She and her fiancé were going to elope in 3 days, and she wanted to wear a proper wedding gown. This was the one she could afford – and it was 3 sizes too small. Could we help? Lan took the customer’s measurements and quickly got to work, taking fabric from the train to add inches in the bust and waist and of course altering the train so it didn’t appear altered. Once the alterations were completed, Carrie and her staff cleaned and pressed the gown. All this was done in just 3 days time. When the customer came to pick up the gown, she couldn’t hold back – the tears just fell. Happy tears of course. And we’re so glad we could have a part in making her day even more special. A few weeks into first grade, Gray’s school sent home paperwork announcing Cub Scout sign ups. He was all over it. Matt took him and so began the daily reminders of needing a uniform. The following week I purchased the basics, which included 5 patches that needed to be sewn on. Yikes. I’ve admitted numerous times that I have an aversion to sewing. So the idea of sewing on 5 patches (and having to sew them on regularly once he started earning them) left me feeling quite displeased. But Gray was so excited – night after night he would lay everything out on the dining room rug. He would carry his handbook and paperwork to his room every night and put it by the door so he would remember to get it first thing the next morning. I had to get up the gumption to get over myself. • Position and pin in place before starting. I even measured to make sure they were straight. I didn’t have straight pins, so I used safety pins. • This was the really big one for me -- Stitch the patch to the uniform by sewing all the way around the edge of the patch using the same color thread that is on the part where you will be stitching – see their steps #10 & 11. What they recommended was not how I had planned on doing it. Big save. • Don’t double the thread. When I doubled the thread, the slight difference in color between the thread and the patch was really noticeable. So I ripped it out and did it again. • The end of the ironing board is very handy, especially as you try to get the patches positioned on the sleeve. I’m pleased with the results. Gray is especially pleased with the results. Most of all, I learned how to properly sew on a patch. BTW -- They also list tips at the bottom of their page. I especially liked this one: “Teach child to sew his or her own patches when they’re old enough.” Done! Back on Administrative Professionals Day, I shared with you a really nice thing my boss, Chris Edwards, did for us one year. Today is Boss’s Day. It’s time for us to let our boss’s know that we appreciate them too. I was hired by A Cleaner World in 1996. I was in my latter 20’s and had held a few positions since graduating from college. In those few positions, I’d had a mix of bosses. We’ll just leave it there. After a short period at A Cleaner World, I knew that Chris was the kind of boss I needed. He was there for support and guidance. He laid out my responsibilities and expected me to do to my job. I did, and it was perfect. Being single and young, I was also involved with the Greensboro Jaycees at the time. So realizing that I found the place and boss for me, I nominated Chris for Boss of the Year…..and he won! I don’t remember the details or even the year anymore – I think it was somewhere around 1998. My memory has slipped a bit with age. The one thing I do remember is that I had to get up in front of a bunch of people, make a speech, and present him with the award. That I didn’t forget and still remember the “I’m going to throw up feeling” before walking to the podium. I have a HUGE fear of public speaking! But I survived. And I’d face that fear and do it again today if I could. I still think he’s the best boss I’ve ever had. Meet Jim Mitchell, Tennessee Goat Farmer extraordinaire and my father-in-law. One evening after dinner, Jim and I were discussing things, life, whatnot. Somehow the conversation turned to making Goat’s Milk Soap. On the drive home I decided that was something we needed to do. I spent some time searching and found this recipe. It seemed easy enough. I shared my fine idea with Jim, who offered to hold the goat while I milked it. WWWHHHAAATTT? Go ahead and admit it. You’re impressed. If I’m being completely honest, I had lots of fun with this. It was really easy, but it wasn’t cheap. I spent about $45, not including the olive oil and of course the goat’s milk, on all the supplies and ended up with 14 bars in various sizes. I do however have enough supplies, except for the essential oil, to make at least one more batch. I’m definitely going to do it again, but I need to let it cure for about a month to see how the lavender scent is. I want to see if I should cut back on the essential oil. If you decide to be adventurous and make soap, one warning – careful with the essential oil. It is powerful stuff. I swear I had lavender burnt into my nose for days. My husband loves fall for the cooler weather, many colors, and deer hunting. My son loves fall because it’s the beginning of holiday season, with his favorite being Halloween. I love fall because of ---- Give A Kid A Coat. And this year’s kick off is just around the corner! Mark your calendar and join us on Friday, October 11 from 5:30 a.m. to 10:00 a.m. at the A Cleaner World located at 2527 Eastchester Drive in High Point for a live event with Fox 8, 1075KZL, and The Salvation Army. 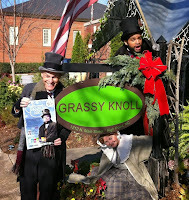 As always there will be great food, local celebrities, and wacky entertainment. I cannot begin to put into words just how much I love Give A Kid A Coat. To me, it’s one of many examples of what makes our community great. Its folks reaching out to help others because they can – and they want to. And seriously, look at these faces. How could you not love Give A Kid A Coat too? I think this statement is true for any industry – Sometimes when there are changes in management, both the employees and the customers have a hard time adjusting. That’s not the case at the A Cleaner World in Thomasville. Donna Lawhorn joined the A Cleaner World Thomasville team in April and didn’t miss a beat. In fact, she’s already made a few raving fans. Recently a customer brought in several baby sweaters she made years ago for her son. She must have stored them in a basement or attic because they were in terrible condition. Now her son is almost 40, and she wanted to give them to her grandchild. Donna said the customer didn’t have much hope when she dropped them off. Donna and her team were able to restore them, and now a new generation gets to enjoy a handmade treasure. She’s also made a raving fan at one of the local churches. A church member brought some tablecloths by. Apparently they’d had an event, and the tablecloths were put away dirty. Needless to say, the spills had plenty of time to do some permanent damage. But once again, Donna and her team came to the rescue. These kinds of things happen on a regular basis throughout our stores. And as I’ve talked to our managers over the years, I’ve found a common theme. They all love working with people. They love their customers and their employees. They love to make people happy – like taking care of the new grandma or the local church member. Donna fits right in with that group. I heard the pride in her voice knowing that she had made someone’s day simply by providing top-notch service. And while she hasn’t been in Thomasville too long, she’s already started getting to know the regulars, and her employees have made her feel right at home. I’m sure most mothers feel the way I do – I get so frustrated when I find my son’s dirty clothes scattered about. But if I am completely honest, it’s my fault. My routine each morning is the same – get up early (really early), run, then I rush around to get ready for the day. But because I am rushing around getting ready myself, Gray dresses himself wherever I deposit his clothes. As a result, he leaves his pajamas on the floor in the room where he has dressed himself. And this can be anywhere – the dining room, living room, our bedroom. Let me also throw in there that he habitually leaves his dirty socks in the mudroom. This has become a big irritation. I must fix it; otherwise I will be picking up dirty pajamas and socks until he goes to college. One thing I know about my son is that he is motivated by stuff. So I am going to let him pick out his own laundry basket or hamper. I’m going to let him decide where to put it (unless it is someplace like the living room or kitchen). Then I am going to train him to place all his dirty clothes in it. I am also going to train myself to resist picking up his clothes. If they don’t make it into his basket, I will not wash them. So the next time he wants to wear his Perry the Platypus t-shirt and its not clean…... And I will also institute penalties for fouls. I’ve got this. Now if I can only train his dad to deposit his dirty clothes in one place. Do you have a dirty clothes scatterer? If so, we’d love to know how you fixed the problem. My son is obsessed with Star Wars. When he started that obsession, I wasn’t too worried. That’s because when he develops an interest in something, it usually only lasts a week or two. But this obsession has lasted months. So when his Uncle Larry gave him a Darth Vader sleeping bag, he was beside himself. He’s been sleeping on his bed in the sleeping bag nightly. So given my obsession with cleanliness and the fact that I wash our sheets religiously every Friday, I had to quickly learn about washing sleeping bags. Most sleeping bags can be washed but check the care label before cleaning because many contain down or fiber filling. Sleeping bags should be washed separately on gentle. To wash, add the detergent to the washer and partially fill it with warm water. Submerge the bag into the water to expel air, then allow the washer to finish filling. Periodically stop the washer, open the lid, and press air from the bag to help ensure good cleaning. Typically they can be tumbled dry at regular temperatures. You can add a clean tennis ball to the dryer to help fluff up the filling. If the sleeping bag is too bulky for a home washer, or if it says what mine does – “Use only oversized commercial front loading washing machine with rotating drum action. Do not use top loading agitator style machines.” – then you can either hand wash it in the bathtub or bring it to us. We can take care of it for you. • Buy all the classroom supplies at the beginning of the year. For Kindergarten, Gray’s list was broken into two semesters so I only purchased the first semester items at the beginning of the year. Why would I want to spend money when I didn’t have to? Then in January, I went to purchase the remaining supplies. I had to pay full price for things like crayons and pencils. I should have stocked up on them at the beginning of the year when they were insanely marked down. It hurt to pay over a $1 for a 24 pack of crayons when just a few months prior, I paid 19 cents a pack. • Buy a size ahead. I recently got a pair of Sperry tennis shoes for $4.25. It was the last pair this store had. They are a size too big but when he outgrows his current tennis shoes, he will be ready for these. He also has polo shirts two sizes too big hanging in his closet. When you can get a name-brand polo shirt for $3 and can plan for it, why not? Just be careful not to let them pass that size by. • I am going to start repurposing items. Gray is a long-legged skinny thing. Since he is a boy, I don’t think jean capris are acceptable. So I thought -- why not cut jeans off and make them shorts? Of course since I cannot sew, I am going to ask my mom to help me with this project. If you can’t sew, A Cleaner World’s alteration department can help you out. There are tons of ways to cut corners and save a few dollars as you prepare for school. Also try things like sharing with friends, hitting yard sales, and if you are in the Triad checking out WeeRuns. If you have some back-to-school saving secrets, we’d love to hear them! Just leave a comment below, on our Facebook page, or tweet us @cleaner_world. A few months ago, we got new bedroom furniture. Agreeing on that was much easier than agreeing on a new comforter. But we did, and I was so excited the day I put it on the bed. But that annoying tag ended up on my side of the bed. You know – the tag the manufacturer sews on that includes instructions on how to care for your comforter. I so desperately wanted to cut it off, but I remembered a conversation I once had with Mike Taylor, Managing Partner of our A Cleaner World Roanoke division. Mike was frustrated that day because a comforter had been dropped off for cleaning, and the tag had been removed. He said that even after 25+ years of cleaning comforters, he still refers to the tag before cleaning. He told me that if it is dry clean only, and you wash it – it’s ruined. If it is wash only, and you dry clean it – it’s ruined. Wanting to take care of the customer, he examined the comforter to determine which cleaning method to use. He determined incorrectly and therefore bought the customer a new comforter. While Mike agrees that the tag is annoying, he said it is so important and helpful to dry cleaners. He estimates that 40% of the comforters and bedspreads he sees have the tags removed. His suggestion – pin it up underneath on the backside so it can’t be seen. But never, ever cut it off. And so I didn’t. Crazy sayings and jokes aside, bedbugs are serious business – especially to the daughter of my church mentor mom. Debbie said her daughter noticed lots of bite marks on the arms of some foster children she was keeping. She took them to the doctor who said they were either flea bites or bedbug bites. The foster children were only at her home for a few days before returning to their family. After they left, she noticed a couple of bedbugs crawling on the bed skirt of the guest room bed. Needless to say, her family moved in with Debbie for 12 days while a pest control company got rid of them at a cost of around $2,000. Bedbugs are small, flat, oval insects that feed on the blood of people and animals while they sleep. They can be brought into your home by houseguests or by clothing or luggage brought back after traveling. While nothing is 100% foolproof, we’ve put together a list of things you can do to hopefully lessen the risk of being attacked by these pesky creatures or worse of all, have them catch a ride home with you. • When traveling, place your luggage on the bathroom counter – they are not likely to be in the bathroom especially if it is made of hard non-porous materials. • Then carefully inspect the entire room – drawers and closets, bed including the headboard, linens, and remaining furniture. • If you find them, inform the hotel and then ask for a new room – one not neighboring the infected room. Once in the new room, start inspecting again. • When you get home, consider leaving your luggage outside (if that’s possible) while you unpack. • Inspect items as you bring them in and thoroughly inspect your suitcase before bringing it in as well. • Wash and dry clothing on the hottest setting possible. • Vacuum out your luggage before bringing it in and putting it away. Let us know if you have any helpful tips to share so that we can all sleep tight without the bedbugs biting. Matt and I got married when we were both 30. Translation – we were pretty set in our ways. I know I’ve mentioned many times that I have an aversion to clutter. Matt does not. He lays stuff down on any flat surface he can find. That caused many a disagreement when we first got married. I would go behind him and either move stuff or throw it away. Over the years it has had different locations in different homes, but it now has the perfect location. It is in the kitchen near the back door on top of a chest of drawers that I use to store linens. Matt comes in the back door, stops at the safe zone, and unloads his pockets. On his way out the door, he stops at the zone and loads up what he wants to take with him. Sometimes fighting to change a habit isn’t always the solution to the problem. If you have a clutter scatterer in your house, consider this trick. It has worked well for us. I’ve mentioned before that some of our best store managers weren’t originally hired to be managers; they started working in one particular area of a plant and demonstrated traits that made us realize that they were capable of so much more. The manager of our A Cleaner World on North Main Street in High Point, Veronica Ruiz, is another example of that. Over ten years ago, Veronica was hired to work in the production area of one of our Triangle locations. Over the years she held various positions before becoming the ‘right-hand’ for Tim Rolle, the manager of our A Cleaner World in Apex. So two years ago when we needed a store manager for our High Point store, she was an excellent fit. Moving to High Point was an easy transition for her and her family. She likes High Point and believes it is a great town for kids—and she has three so between her children and long work hours, she is a busy person. But the thing I noticed about Veronica is that she’s always so happy, and that happiness seeps into everything she does. Whenever I made note of that to her, she shared with me her philosophy – “whatever you have to do, do it happy,” Veronica told me. “If folks see you happy, then they will be happy too. It makes me feel good to make others happy.” And that happiness comes through in all her work. Plus it has spread to both her employees and her customers, making the A Cleaner World on North Main Street in High Point both a fun place to work and a great place to do business. I love to visit my parents; it’s like a big Barb and Gray fest. We do all kinds of fun things and my mom makes my favorite foods. But I don’t really like showering at my parent’s house. Why? I feel like I never get dry. For years I couldn’t put my finger on it. Then after one visit, Matt commented that the bath towels felt just a bit damp. He diagnosed the problem – too much fabric softener. According to ehow.com, fabric softeners were created at the beginning of the 20th century from emulsified water and oil to create a softer feel to washed clothes. Fabric softeners have evolved over the years to include a number of chemicals. I don’t use them so I don’t have any personal experience to share. I do admit to using Tide with Fabreeze on my running clothes, but I use fragrance and dye free detergent on everything else. And that’s simply because I have sensitive skin. There are all kinds of articles online about the dangers of using fabric softeners – hazardous chemicals, scents that trigger asthma attacks, etc. Besides the health risks, fabric softeners can cause problems with your clothing and dryer. According to yahoo.com, using too much fabric softener can cause an oily film on fabric. The film can make clothes feel slimy and it also decreases water absorption on towels. That explains the never feeling dry thing at my parent’s house. What do you use if you want to achieve a softer feel to your clothes and towels? Here’s what I do – I add vinegar to the rinse cycle. It softens clothes, has fewer chemicals than fabric softeners, and it costs less! When I lived in North Carolina and went into the office every day, I would pass by two Starbucks locations before stopping for my coffee at the third location. There was something about that third location that I just liked – they knew me by name, they knew how I liked my coffee, and they started it as soon as I walked in the door – before even ordering. With all the people that came through those doors, they remembered my preferences and that caused me to pick that location day after day. I recently spoke with Warren Lackey, a customer of A Cleaner World on North Main in High Point, and asked him if there was something in particular that kept him coming back. “Veronica, the manager, is always smiling and calls me by name, which is so rare these days,” explained Mr. Lackey. “Not only is she friendly and helpful, but she consistently pays attention to those little extra details like how I like to have my shirts finished and the way I prefer to have my clothes placed in the car.” It’s those little things by both Veronica and her staff that’s caused Mr. Lackey to choose A Cleaner World week after week for at least the 17 years that I’ve worked for the company. When you stop and think about it, many of the choices we make are based on such small things but that are somehow so important – at least to us. Sir Arthur Conan Doyle, best known for his stories about Sherlock Holmes, was right when he said “It has long been an axiom of mine that the little things are infinitely the most important.” Agreed. Last year I mentioned that I had this adorable little dog named Libby for around thirteen years. She was a fantastic little dog – really well trained and behaved. But on a rare occasion she’d have an accident in the house. Shortly after we moved into our house in Jamestown, she had an accident on the rug in the hallway. I cleaned it up using a store-bought carpet spotting cleaner. Later I quizzed Greg about the best way to handle something like that – and before he told me how to fix it, he scolded me for using such a product. He said that while it appeared that the stain was now gone, I needed to watch as a ‘gray’ spot will appear over time. He proceeded to explain why. But clearly it was too technical because I had to call him to get him to explain it again before sharing this with you. Here it is simplified for my brain. Carpet has a relatively neutral pH – around 7. Store-bought carpet cleaning solutions are very strongly alkaline. We took a look at a MSDS sheet of a well-known brand and it was 9.9. Soil on the other hand, according to Wikipedia, typically is in the acidic range of 5.5-7.0. When you spray the cleaner on the stain and don’t rinse it well to neutralize the pH the soil, which is an opposite, is attracted to that area. As the detergent sits there, it just attracts more dirt over time. How do you fix that problem? Greg’s solution is to always give a sample bottle of spotter away to customers after they have their carpets or rugs cleaned by A Cleaner World Carpet and Rug Cleaning. The pH in that cleaner is around 7.2, which is pretty neutral so it doesn’t leave a sticky residue behind. But if you decide to use an alkaline product at home, then be sure to rinse well with something that is on the acidic side afterwards so it neutralizes the carpet. And as always, please let us know if you have any questions. You can always call Greg at 336-992-0700, leave me a message on Facebook, or tweet me @cleaner_world. When my son gets fixated on a project, there is no stopping him until he is finished. He eats, sleeps, and breathes it. In fact, he’s been known to sleep with a work-in-progress art project and then bring it into our room around 3:00 a.m. wanting to know if he can work on it right then. Since Friday is Flag Day, I thought this art project story would be a great one to share. On a recent rainy afternoon, Gray asked Matt to print some pictures of the American Flag off the Internet so he could make a special coloring book. Gray took the pages Matt printed, spread them out all over the dining room floor and spent the rest of the afternoon coloring the pages and then stapling them together to create a book. He then carried that book around for days talking about how special it was and asking all kinds of questions about the American Flag. A Cleaner World thinks the American Flag is special too. That’s why we clean American Flags for free –everyday. We’re also happy to help out if you have a flag that needs repairing or if you need a worn or faded flag to be properly destroyed. So stop by one of our locations if you have an American Flag that needs some special attention. It is standard practice for A Cleaner World to check every pocket before cleaning a garment. Recently I once again failed to check Matt’s pockets when doing laundry at home which resulted in this – an ink load. When I pulled the clothes out of the washer I was baffled. What in the world had I done to these white clothes to create such a streaky black mess? I fished around the front seal of the washer to find the culprit – a black pen broken in half. At first I was mad at Matt for leaving it in his pocket. Then I was mad at myself for once again failing to check his pockets knowing his habit. (On a side note - when I shared this post with him he pointed out that if it weren’t for him, I wouldn’t have nearly as much to write about.) Then I got over myself and went to work trying everything I knew to get the ink out of a handful of items I wanted to salvage. I failed and so there were a few items I had to replace. I ended up spending about $150. Expensive lesson. If the same thing happens to you, I have some suggestions that will hopefully help you spend far less than I did. • Don’t tumble dry the items, instead air dry them – heat can set the ink permanently. If it does happen in the dryer, unfortunately there isn’t much that can be done. • Find the pen and all its pieces. Be sure to clean or wipe out the drum of the machine. Don’t use any flammable cleaner in the dryer. • Take the pieces to A Cleaner World. We have soaps formulated for ink removal and the technical knowledge that will increase the chances of a successful outcome. If you have any questions about ink stains, please feel free to post a message on our Facebook page, send us a tweet @cleaner_world, or an e-mail at acwwildwed@gmail.com. We’re glad to help. Fourteen years ago today, Matt and I got married. We had a lovely outdoor wedding and reception with about 100 guests. There were so many things that made it special – a lovely dress, great weather, delicious food, and being surrounded by family and friends. But like every wedding, there were a few hiccups. I know everyone has wedding planning advice but I thought I’d share my mishaps in hopes that you can at least avoid these on your special day. • Be absolutely comfortable with your caterer. We used a family friend, and I felt uneasy about it the entire time. Seems my uneasy radar was right on – while the food was delicious, the meal was delayed because the caterer didn’t have everything ready, she over charged us, and she ran out of food. My parents ended up having dinner at Burger King around 10:00 that night. • Use a professional photographer. We didn’t, and that was my biggest regret. We thought it was an easy way to save money. We again had someone we knew use our camera to take pictures and then also placed disposable a camera on each table so guests could snap pictures. Big mistake. • Make sure your shoes match your dress. Try your dress and shoes on in the setting and exact lighting well before the ceremony – that way you have time to correct any problems. In my case, I got married outside. My shoes weren’t dyed dark enough so they appeared to be too light in comparison to my dress. • Give yourself at least a month to have your gown altered. You should plan to have at least two fittings. Remember to bring all the items you plan to wear under the dress as well as the shoes to ensure a precise fit. I cut this one way too close. But here’s the bottom line – do your best to plan but don’t go crazy. Things will go wrong – it is inevitable. Keep it in perspective and enjoy the day – however, it is only one day in the rest of your life. And that rest of your life part is way more important. When we think of disasters, we picture the forces of nature: earthquakes, hurricanes, floods, and other weather-related calamities that threaten our homes. Home fires don't fall into this category because they seem preventable. And yet, home fires are one of the most common disasters in the country. The best way to protect your home from a fire is to understand why and how home fires happen, and to insure your home against fire damage. It's important to educate yourself about fire prevention, including electrical, kitchen, smoking hazards, among others, as well as how to clean your home to reduce fire risk. However, even the most cautious home owners can experience a house fire. In this case, you need an escape plan the entire family understands and good insurance. Not all home insurance policies come with fire coverage. To make sure your home is protected, carefully review your policy to make sure fire damage is included. To learn more about fire safety, prevention, and insurance, The Simple Dollar’s fire insurance resource offers a quick, but thorough, read about how to protect your home from a fire, both before and after the fact. I tend to be an over-packer. So when Matt and I prepared for our 17-day trek around Europe a few years ago, I had to do some major finagling. There were specific rules on luggage – only one bag per person, within a certain size and it had a weight limit (which I went right up to). Of course I did all those things like coordinate colors to get more outfits. But I knew there would be a time on that trip when I’d have to wash something in the bathroom sink. First let me say that I packed enough underwear so that I’d have one clean pair per day. I just couldn’t stand the thought of washing those in the sink. Besides they didn’t take up much room. • Put the t’s in, let them soak for a minute or two then used the method my Grandmother used when washing her clothes in a ringer washer (something I vaguely remember from childhood) – I plunged and rubbed. • After a few minutes, I let the water out and rinsed the t’s. • Once all the soap was removed, I squeezed out as much water as I could. • Then I hung them up in the bathroom using whatever method I could find. When thinking back about this big adventure (the laundry part not the actual vacation), I was certain there were lots of things I didn’t think of. While writing this blog I found a great article on travelblog.com that gave lots of helpful suggestions. After reading it, I wasn’t nearly as prepared as I thought I was. And if we ever take a long trip like that again, I’m going to plan on doing that a bit more so I can actually manage my own bag during the trip. When Matt and I were shopping for our first house, we went into what seemed like thousands of homes. Two actually left an impression on me. Obviously the one we purchased. The other memorable home was the one that I refused to go in. It was a lovely place, at least on the outside. We opened the front door and this horrendous smell greeted us. What was it? According to the realtor, it was pet urine. The humanesociety.org states that approximately 78.2 million homes in the U. S. owned dogs in 2011-12. That’s a whole lot of homes with potential accidents on carpet and rugs that require immediate attention. Clearly the homeowners mentioned above didn’t believe in immediate attention. 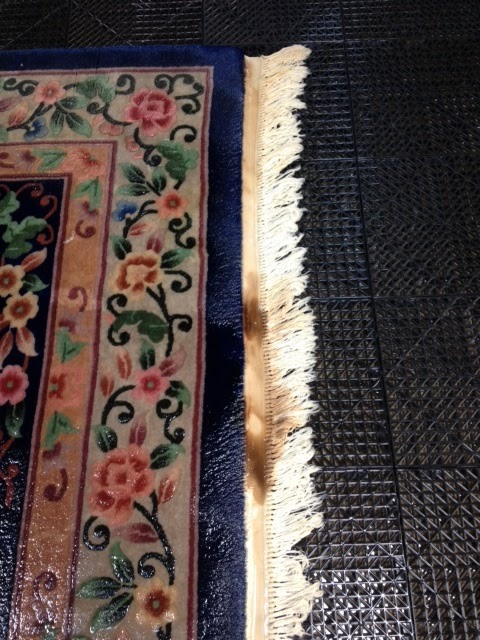 Here’s a picture of what can happen if pet urine is left untreated on a rug. Here’s the same rug after Greg spent an afternoon cleaning it. ﻿If your pet urinates on your carpet or rug, don’t let it go untreated. Dried, untreated pet urine leads to permanent stains and bacterial growth. If your pet urinates on your carpet or rug and you discover it while it is still wet, blot the area to remove the excess. Then dilute the area with water and blot (don’t rub) until no more color is visible on your clean, white towel. Ideally, next you’d have your carpeting or rug professionally cleaned. If you can’t immediately have the rug professionally cleaned, consider using an enzymatic cleaner to remove the stain and scent. And while we realize it isn’t feasible to have your rug professionally cleaned after every single accident, the standard 12 – 18 months may not apply in your home if you have pets. If you have carpet or rug questions, contact us. Call Greg at 336-992-0700, leave a message on our Facebook page, or Tweet us, and we can help. Three years ago A Cleaner World joined the social media world. I’ll admit that I was a bit uncertain – after all, what in the world would a dry cleaner have to say? Well it turns out that there is much to share. Over these last three years we’ve offered lots of helpful advice. We’ve been able to help solve some problems. You’ve shared in my household mishaps and hopefully learned from those. And many of you have inspired me to try new things. I feel like we’ve become a part of each others lives. That’s why I am so excited about our upcoming Tweet Up! It is a chance for us to connect in person. A chance to put a face with a Twitter handle. So please join us on Wednesday, May 22 from 12:00 – 1:30 at the A Cleaner World located at 1949 Battleground Avenue in Greensboro. The folks from The Salvation Army will be there accepting donations for their family thrift stores. East Coast Wings will be providing lunch. There will be goodie bags. And most of all, there will be lots of other Triad folks like you to chat with. If you plan on joining us, tweet me @cleaner_world so I can make sure we have plenty of good food to enjoy. Hope to see you there. What’s your Love Language? If it is possible, I have two. Well actually I have one dominant one – Acts of Service followed closely by Quality Time. So if someone is doing something nice for me while spending time with me – well look out. Today is Administrative Professionals Day. In the A Cleaner World corporate office, we don’t need much of a reason to celebrate. After all, Crystal once proposed that we get a cake for Sherlock Holmes’s birthday. But one particular year, instead of the normal gift, cake, or flowers, Chris took us all to a luncheon at the High Point Country Club. It was such a treat -- not just because of the good food, door prizes, lovely speaker, or laughter. I think also because he did all the work himself, and he attended it with us – laughing and enjoying as much as we did. If you are so blessed to have an Administrative Professional in your life – you know that behind the scenes person that makes your life much easier – take a few minutes today to let them know how much you appreciate them. It could have a lasting impression. 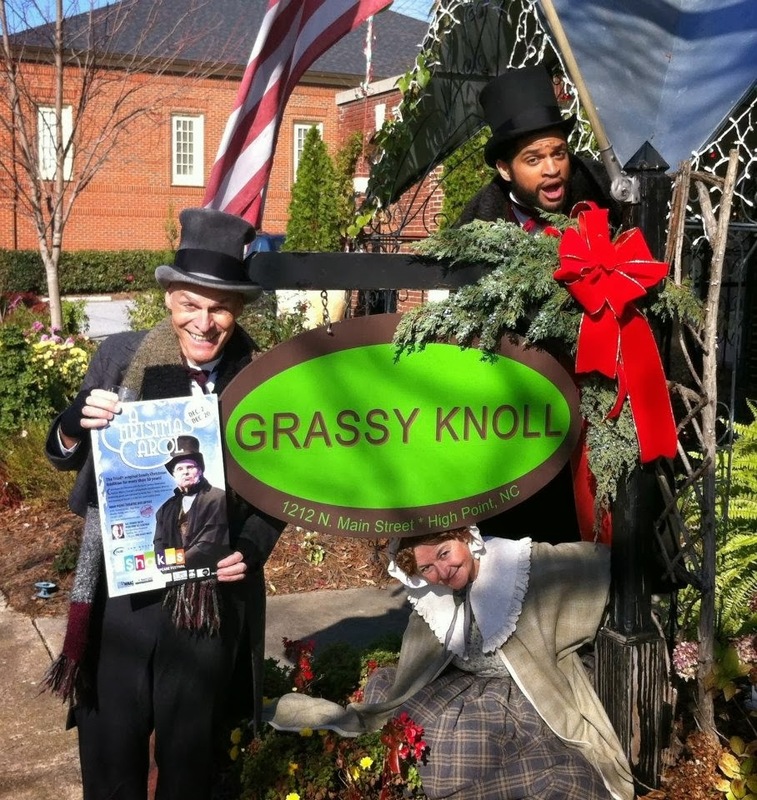 Greg recently picked up a rug from a customer’s home, but it wasn’t just any rug. This was a 100% Chinese silk rug that cost $14,000 and took two years for the customer to find. As always, he thoroughly inspected it and discussed the issues with the customer before leaving. There were three major things going on with the rug. First, someone had used a grocery store spotter on the rug to try and remove a stain. It didn’t ruin the colors (which sometimes can happen) but it did make the area brittle and stiff as the cleaner caused all the silk fibers to get matted together. Second, there were several areas where the pile was worn in the wrong direction. A rug has a particular way or direction. When you groom a rug in the right direction, it appears shiny. When it is worn or groomed incorrectly, it looks dark and dirty. This primarily comes about by foot traffic and never rotating the rug. Finally, she had pets. Pets typically mean urine stains. Greg took the rug to our dedicated rug facility and immediately went to work. He was able to get out all the crunchiness from the spotting cleaner, reverse the pile into the proper direction, and remove all evidence of pet urine. 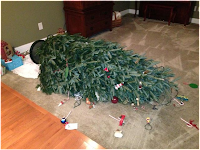 Our customer worried and fretted until he returned the rug. When she saw it, she was pleased. In fact she was better than pleased – she told Greg that it hadn’t looked that good since the day she brought it home from the showroom. I completely understand why she worried and fretted, given the time and money she put into finding the perfect rug. But knowing what I know, I could have saved her all that worry. Her rug was in good hands. I’ve known Greg, the managing partner of A Cleaner World Carpet Cleaning, for over 15 years. Whenever I think of Greg, I think of the guy I know personally – a fun guy with non-stop witty one-liners. But he has a serious side – he is truly committed to taking good care of his customers, whether it’s returning a rug to them in showroom shape or helping them make an educated and wise rug purchase. Here’s a great example of what I’m talking about. 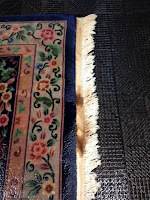 Recently, a customer dropped off a rug for cleaning explaining that the rug was putting off a powdery, dusty substance. The first step in the process is a thorough inspection; Greg inspects the entire rug including the fringe, body, edges, and back before beginning the cleaning process. So while inspecting this particular rug, Greg noticed that the underside of the rug had begun to separate from the top. Backing separation is a common occurrence -- the secondary backing is glued together by a thin layer of latex. Latex deteriorates over time and simply loses the ability to hold the rug layers together. And while there might be instances where the old latex can be removed and the layers be re-glued, it is a process that is both time consuming and expensive. Greg contacted the customer and shared what he found. He also stated that cleaning the rug would not solve the problem. The customer came by to pick up the rug and explained that he was just going to apply the money he would have spent on cleaning the old rug toward the purchase of a new rug. Greg asked the customer if he had a few minutes, and he took the customer to our processing room and showed him a number of rugs – pointing out the differences in construction and explaining what to look for as he started shopping for a new rug. That’s the way he approaches running his business – looking for the best way to take care of his customers even if it means simply taking time to educate – and hopefully throwing in a few good one-liners along the way so that they too can see his fun side. My goodness. I am thankful that I have 10 years before I need to worry about this. It looks like we’re going to have to set up a prom fund alongside Gray’s college fund. So reading what I did on promgirl.com, here are some suggestions toward a more affordable prom. Dinner – Figure out how many kids you can accommodate and create a restaurant like environment in someone’s home. Have someone like me that loves to cook whip up a gourmet meal and have some cool grownups (not anyone’s parents) act as servers. Hair, Makeup, Nails – Let the girls get together and help each other get ready. Kids these days are incredibly sophisticated and creative. They will all end up looking great and will have lots of fun in the process. Gown – I’m all for borrowing and then adding a few accessories. There are also sites and places where you can rent perfectly lovely dresses and such. Just make sure you are doing business with a reputable establishment. Formal Photography and Limo Rental – Are these things really necessary? Take pictures beforehand. Besides they all have iPhones and will be snapping photos of themselves all night. If you are comfortable with it, let your kids borrow the nice family car. If not, again see if some cool adults will ‘chauffer’ them around. Finally, set a budget, tell your child up front, and stick with it. Let them figure out where they want the money to go and what they can live without. That way it takes the stress off of you. When Joe McDaniel was in the Army stationed at Fort Bragg, he fell in love with North Carolina. As an outdoor enthusiast, it offered all the things he enjoyed – hiking, skiing, and fishing. So when he completed his tour of duty, he decided to stay. Many times our best A Cleaner World managers aren’t originally hired to be managers. That’s exactly how it went with Joe. He actually came to us looking for part-time weekend and evening work to help supplement his income. As soon as he walked in the door to apply, Mike Feudale (A Cleaner World District Manager) told the manager she needed to hire him. When I asked Mike why, he couldn’t really put his finger on it but he said he saw something special in him immediately. After only working a couple of weeks, the store manager became ill. Joe was asked and agreed to fill the position on a temporary basis. When it was determined that the manager couldn’t return, Joe was offered the position. When I asked Joe what he liked most about A Cleaner World, he said the people. He loves the people he works with and for, he loves the community, and most of all he loves his customers. That comes through in so many things he does – from being involved with the sheriff’s office, The Salvation Army, and high school to those little extra things he does for his customers. Here’s a great example of a little extra thing. When Joe started making his regular runs to the post office and bank, he noticed that many of those folks were his customers. He also recognized that many of them kept the same hours he did, often making it difficult to drop off and pick up their clothes. So he offered to take their express bags back with him, process their clothes, and bring back clean clothes on his next visit. That little extra thing has made him a huge hit at many local businesses. Those little things have also made him a huge hit in our eyes too. Great job Joe and continued success in the great town of Boone! I’m guessing Levi Strauss and Jacob Davis wouldn’t have liked that comment. My love/hate relationship with blue jeans and my quest to find the perfect pair dates way back. In fact, I remember wearing dresses to school in junior high because I felt so uncomfortable in jeans. If only khakis and yoga pants had been popular back then. • In 1853 Levi Strauss started selling blue jeans under the name Levis in San Francisco. • Levi Strauss and Jacob Davis received a patent in 1873 to make the first pair of men’s denim work pants. • Jeans were originally worn by workers because the material was strong and didn’t wear out easily. • James Dean popularized jeans when he starred in Rebel without a Cause, prompting the youth rebellion during the 1950s. • Skinny jeans actually date back to the 1950s with celebrities like Gene Autry and Sandra Dee wearing their pants very slim to the ankle. • Jeans became high fashion in the 1980’s when famous designers started making and putting their labels on them. • According to Wikipedia, Americans spent more than $15 billion on jeans in 2005. • North America accounts for 39% of global purchases for blue jeans per denimsandjeans.com. • According to Cotton Incorporated, the average woman owns eight pairs of jeans. • According to askmen.com, the average man owns seven pairs of jeans. While my HE washing machine has definitely been a money saver, I’m not sure I’d purchase another one. Here’s why -- the thing requires too much attention. I swear I don’t remember having to clean all kinds of places in my top-load washing machine. That’s the soap drawer. That’s also nasty. In an April 2012 blog post, I commented on the down side of having a HE washer – my problem was a musty smell from the laundry room. After researching, I found that lots of folks have the same problem and that the smell comes from mold and mildew issues. That really troubled me – I was washing our clothes and linens in a nasty washing machine. I started doing all the things the article suggested but apparently I need to do more. After I made this latest discovery, I went back to see if the article mentioned the soap dispenser. It didn’t specifically. It mentioned following the manufacturers recommendations for maintenance and cleaning, which does include information on cleaning the soap drawer. So perhaps the one last thing I should have done is read the owner’s manual – if not actually earlier as a preventative measure. 1. Read the owner’s manual immediately. Don’t wait two years when you start having problems with the appliance. 2. If you purchase a front load/HE washing machine, be prepared to give it a little extra care. And as a p.s. I’d like to say that I really am a cleanly person even though most of my blog posts make me appear not to be. Meet Crystal Nickell. The folks in the stores know her as the A Cleaner World payroll person, but I know her to be so much more. Professionally, besides being a whiz at payroll, she’s also a General Ledger Accountant, Financial Statement producer, payroll tax expert, and substitute IT department. Fantastic skills aside, she’s also unbelievably fast. I’ve never known a person that can produce so much work in one day. Personally, she’s a devoted wife and mom and a pie-baker extraordinaire. She has such a quick wit about her and this incredibly contagious laugh. She is just plain fun. Sixteen years ago, she responded to a newspaper ad for a Bookkeeper at our corporate office. I remember seeing her resume for the first time and thinking “wow, she’s way more qualified for my job than I am.” During the interview, she asked very detailed questions and was incredibly honest about her willingness to work hard and her desire to leave work at the door when she left so she could enjoy her family life too. I just loved that about her – that incredible honesty. That honesty has created some very memorable moments during the time I’ve known her. For instance, just a few months after she was hired, a group of us were going out to dinner. I posed the question – does this dress make me look fat? She responded – well it does make you look a bit hippy. Finally, someone that answered honestly! I never wore that dress again. And from that point on, I always asked her if I really wanted to hear the truth. Thanks Crystal for your dedication and hard work. A Cleaner World is lucky to have you, and I am blessed to be able to call you friend. Did I mention that I can crochet? Well I should also mention that I’m not very good at it. I know I’ve talked about my grandmother before. She’s the wonderful woman that taught me about baking, sewing, salve, and scented soap. She also taught me how to crochet – something that I hadn’t done in a long time until recently. A number of months ago, Danielle Hatfield (@dhatfield) tweeted about something she was crocheting. Feeling inspired, I went out and bought a crochet hook, yarn, and a how-to book. Now almost a year later I have finally finished my first dishcloth. The instructions called it a dishcloth but it seems to be about the size of a hot pad. I’d also like to mention that the instructions didn’t say to make it crooked. That just somehow happened. The older I get, the more nostalgic I become. Especially on things that I consider to be a dying art. So while this first attempt was less than stellar, I am certain that my grandmother would be proud. Thanks Danielle for inspiring me to give it another shot. I’m starting another one. I hope that this time it won’t be crooked. I also hope this post helps to inspire you to give a dying art a try. I’ve gone and done it again – given advice and failed to follow it. We’ve created a lovely guest room for our visitors – it’s painted a warm color, has a soft bed with lots of pillows, and a nice nook for reading or relaxing with a comfortable leather chair and ottoman with an afghan (made by my mom) thrown over the back. So a few weeks ago I was in that room dusting when I noticed it – fading on part of the ottoman and the arm of the chair. I immediately knew what I’d done wrong. I tend to leave the blinds of the window right next to the chair open. I’ve since started keeping the blinds in that room closed but it got me thinking about where else in the house that fading could be occurring. After going through the house, I noticed that our dining room rug has also experienced some fading. When Matt got home from work, he helped me rotate it – something I should have done over a year ago. Prolonged exposure to dirt, dust, stains, and sunlight can shorten the life of your drapes. Regular cleaning is a great way to add years to their life and beauty. Rotate your rugs at least once a year to help them wear more evenly. Sunlight causes fading and traffic patterns can cause uneven wear. Avoid direct sunlight as much as possible on leather furniture. UV light causes fading and deterioration. Close curtains or blinds during the day to prevent fading. It’s a chores board that is posted on the refrigerator. We came up with a list of age appropriate chores – some that he’s just required to do because he lives here and some that offer an incentive (i.e. money). I thought I’d share it with you just in case you are trying to figure out how to get your kids to help out more around the house. • As a part of the carrying his load with chores, we’ve set up three piggy banks – spend, save, and give. He uses his spend money to purchase toys and things he wants. So now when we go to the store and he wants something, I ask if he’s willing to spend his own money on it. Plus he now donates his give money to church or other places that help those in need. • If he doesn’t do his non-paying chores, then he doesn’t earn any money for the paying chores. I quickly figured out he is motivated by the ability to get stuff. • If he doesn’t do his chores, I purposely point out that I am spending less time with him because he failed to do his job. Quality time with mommy is also a big motivator. We’re tweaking this as we go, and we’re not nearly as good about it when school is in session. But I hope that this will teach him that helping out – whether chores around the house or others in need – can result in joy. I also hope it teaches him, currently at his 6 year old level, about responsibility. That things don’t just happen – we have to pitch in and do our part to make them happen. We’ll see. Like I said, it’s a work in progress. • Consider washing smaller items like socks, wash cloths, and undergarments in their own load to prevent socks from being hidden in larger things. Or better yet, just do a load of only socks. • Pin each pair together with a safety pin before adding to the washing machine. • Give each family member a mesh bag to place their dirty socks in. • Have everyone roll their dirty socks into pairs so they go into the laundry that way. Don’t unroll until they go into the washer and get rolled back up in pairs as soon as they come out of the dryer. • Here’s one my husband practices – he buys large quantities of two exclusive socks – one athletic and one dress – and throws them all in a drawer. That way he never knows when one is missing. And a bonus for me -- I don't have to match up his socks.